Do you have any shaving tips? I have a few that I have learned along the way. For example, shave after you shower for the closest shave. Apply lotion/ aftershave right after shaving to avoid irritation. Most importantly, keep your razor clean. Here is a Gillette and Dollar General video featuring Celebrity Stylist Marcus Geeter on "how to get a great shave". $4 after coupon for CoverGirl Liquid or Powder Foundation! I realized after taking the picture that this coupon had expired. It would have been $5.85 for full size Secret Clinical Strength with the coupon. Those are some great prices! If you pair the prices with the P&G brandSAVER coupons, you can definitely save a lot of money. I bought all products that are staples in my house with the $20 Dollar General gift card. However, Hubby and I were excited to try some of the P&G razors we hadn't tried yet: the MACH3 for Hubby and the disposable Simply Venus razors for myself. The MACH3 has a triple blade shaving system, comfort edges to glide smoothly over your skin and an advanced lubricating strip. 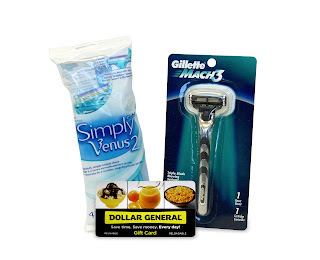 The Simply Venus disposable razors have 2 blades and a moisture smooth strip. My Husband liked the MACH3 and said it gave him a good shave, but he still prefers the Gillette Fusion. I knew that I wouldn't be in love with the Simply Venus just because they only have 2 blades. They do a decent job though and I love that I can toss them in my gym bag and then not worry about tossing them after using them since they are disposable. Disclaimer: I was provided with the mentioned prize pack from P&G. I was not compensated in any other way. All opinions are completely my own. Make sure to soak your legs in warm water first!!! Use plenty of soap or shaving cream. You can use hair conditioner instead of shaving cream. Never shave dry! That's definitely the biggest one! I let my leg soak in the tub, then lather them up with shaving cream. Thanks for the opportunity! Moisturize your legs after shaving. It prevents razor burn and makes your legs even more silky smooth! get your legs really wet and wait until the end of your shower or bath to shave. I used hair conditioner to shave! Best thing ever! Soak, soak, soak and always use a fresh razor!! You can never have too much toilet paper, so I'd stock up! always use a sharp razor!